Holiday parties are a lot of work. 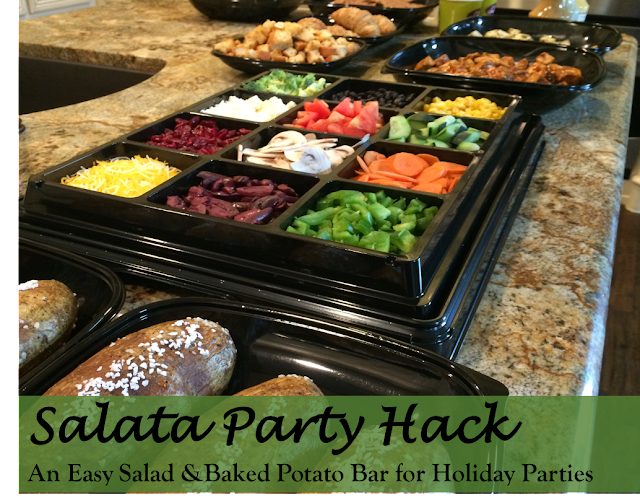 In today's post, I'll share an easy Salata Party Hack for a Salad & Baked Potato Bar. This trendy dinner party idea is a nice alternative to the typically heavy foods that many people encounter at holiday parties. Your guests will love that the healthy salad & baked potato bar is delicious and packed with colorful nutrients. Let me tell you about the Salata Bar and share photos that show how easy it is to put together a fun dinner party for friends and family. It is served with bread, fresh baked croutons, and baked pita chips. The Salata Bar is for a minimum of 10 people and you may add additional servings in increments of 5 people. You will get to select dressing with your Salata Bar. Our favorite salad dressings are the Lemon Vinaigrette, Ginger Lime, and Fat-Free Mango dressings. In addition, you will want to add servings of protein. Salata offers a variety of protein options, but for the Baked Potato Bar, we recommend the Asian BBQ Chicken and the Pesto Chicken. Here is the Asian BBQ Chicken. Here is the Pesto Chicken. Of course, Salata is well known for their soups. These are a great fit with a Salad & Baked Potato Bar! For instance, we love the Tomato Basil and the Chipotle White Bean. The Tomato Basil is my favorite. The Chipotle White Bean is my husband's favorite. The Salata Bar also comes with fantastic croutons, pita chips, and rolls. The baked pita chips with sea salt are my favorite. The rolls are my husband's favorite. My children are big fans of the croutons. Now that I've shown an overview of the Salata Bar, let me share the Salad & Baked Potato Bar that we had at our party. We prepared the baked potatoes with olive oil and course sea salt. Let me share the instructions. Stab each potato several times with a fork. Brush olive oil on each potato. Sprinkle each potato with course sea salt. Bake for approximately 90 minutes, flipping every 20 minutes. Optional: During the last 10 minutes, top each potato with remaining course sea salt. Carefully allow to cool for a minimum of 15 minutes before serving to guests. Finally, while many of our guests love to bring decadent desserts, we also like to make sure that there is a healthy option. The Fruit Salad from Salata is a delicious staple for a dessert table. Salata adds a special touch to the fresh fruit by sprinkling dried cranberries onto their fruit salad. Simply combine the baked potatoes with the Salata Bar, proteins, and soup for your guests to create their own trendy dinners. Serve a fruit salad for dessert. Your guests will thank you for the healthy options! Here are examples of some of the meals that our guests created. There is combinatorial explosion in possible combinations. Everyone was able to create their own idea of perfection. Visit Salata's website here to learn more about their fresh menu items.